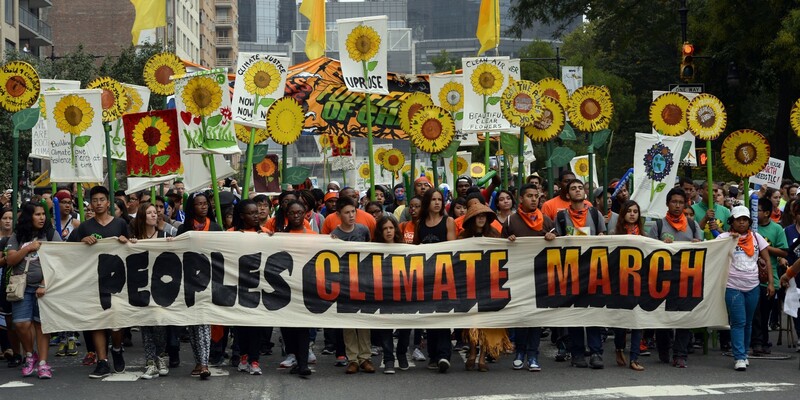 Information from the People’s Climate Movement and us about the Climate March. The best thing to do is text CLIMATE to 21333 so that you can get all the updates during the march. 11:00 AM — We line up to march. Walk, bike, Metro, or bus with your friends to the Capitol Build at 3rd and Jefferson SW and lineup to march. If you’re looking to march with a specific group of people, check out our lineup page — but no matter what, if you come to 3rd and Jefferson you’ll be in the right place. 12:30 — The march begins. We’ll march up Pennsylvania Avenue and surround the White House. 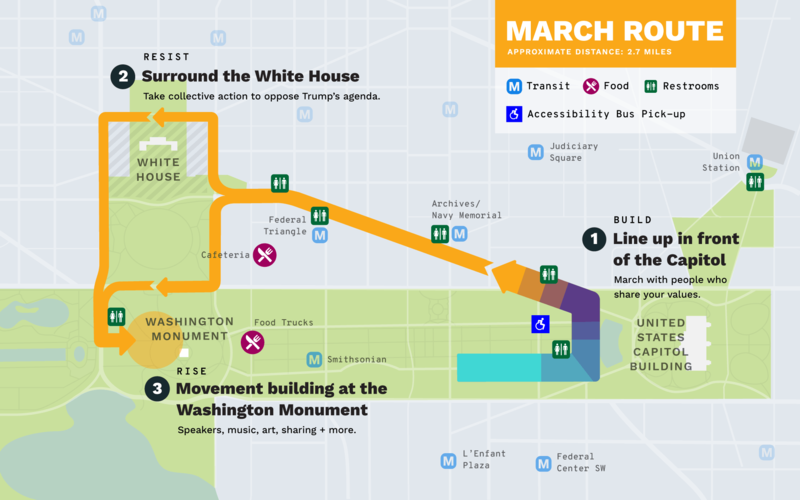 Most people will march north around the White House — those at the end of the march will turn left. There will be a huge jumbotron directing you to the correct side (and if you submit your sign here, that same jumbotron might show your sign to everyone marching). 2:00 — We’ll take collective action. We will hold a mass sit in for everyone who is able — look for march marshals to give the signal to sit. When you see people around you sitting, sit down! For 100 seconds we’ll all build a collective heartbeat by tapping our chests in harmony to symbolize our unified resistance. Finally, we’ll all rise together and celebrate our readiness to fight back with a collective roar as loud as we can. To make sure you’re in sync with everyone else, text CLIMATE to 21333 so that you can get all the updates during the march. 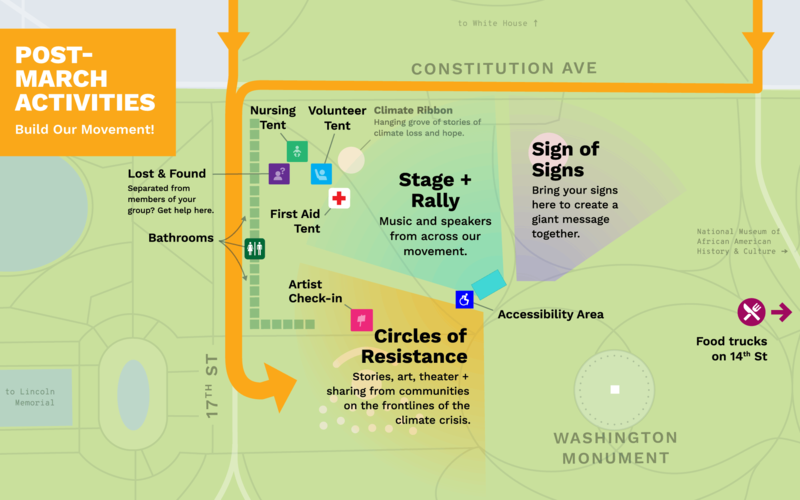 We will reconvene at the Washington Monument grounds to hear from the front lines of the climate crisis and share solutions rooted in our own communities. There will be music and beautiful art from around the country which we will assemble into one massive message of resistance. 5:00 The Peoples Climate March wraps up for the day. After the march, continue to share your stories with us on social media, and send in your photos at peoplesclimate.org/submit. Take Sunday to rest — because on Monday, we all march again with our brothers and sisters in the labor movement as they mobilize for justice on May Day. Remember: text CLIMATE to 21333 to get live updates during the march. This entry was posted in events, Protests, Uncategorized and tagged Climate March. Bookmark the permalink.